We spotted these Kite Kits at The Education Show and thought that they looked so good we should get hold of one to test out at our club. The kites made by the kits are fairly small and diamond-shaped, with satisfyingly long streamer tails and have been specifically designed to be easy for children to make and fly. Assembling the kites is very straightforward and involves only a fold, a couple of bits of sticking with sticky tape, punching a hole and threading through the kite string. The older children had no trouble at all; the younger children needed a little bit of help with getting the fold right and with fixing the strengthening spar in place. It took about five minutes to make a kite. The kite bodies and tails come in an attractive range of colours and the children were delighted that they could choose any colour combination that they wished. Once the kites were made, the children rushed straight outside to test them out. Although the wind was very broken by surrounding buildings and trees at our club, the children still managed to get the kites up in the air. This is because the kites are so small and light that they will fly in almost any conditions. 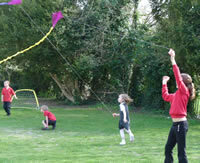 If you have access to a nice open field the children should have no difficulty flying the kites. Even if there is no wind at all, the children can get a lot of fun (and burn up a lot of energy) by running around towing the kites behind them! Although small and light, the kites are sufficiently robust to be played with over several sessions. And being so simple to construct, most repairs consist of little more than applying a bit of sticky tape. The Kite Kits offer excellent value for money as well as excellent play value. 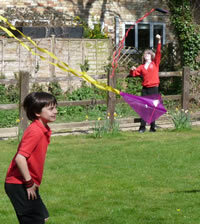 The children were entertained twice over: firstly by making the kites and then by flying them. In addition the Kite Kits provide a craft activity which is not perceived as being 'too girlie' by the boys. All the children were thrilled with their finished kites and continue to have so much fun flying them. The Kite Kits provide a good indoor/outdoor activity in their own right, and would also be a perfect addition to a 'windy day' activity box at your club. 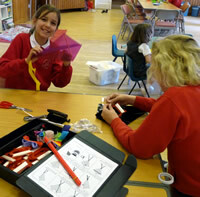 Kite Kits are available in packs of 10, 20 or 100 from Kites for Schools. For more information visit www.kitesforschools.co.uk.